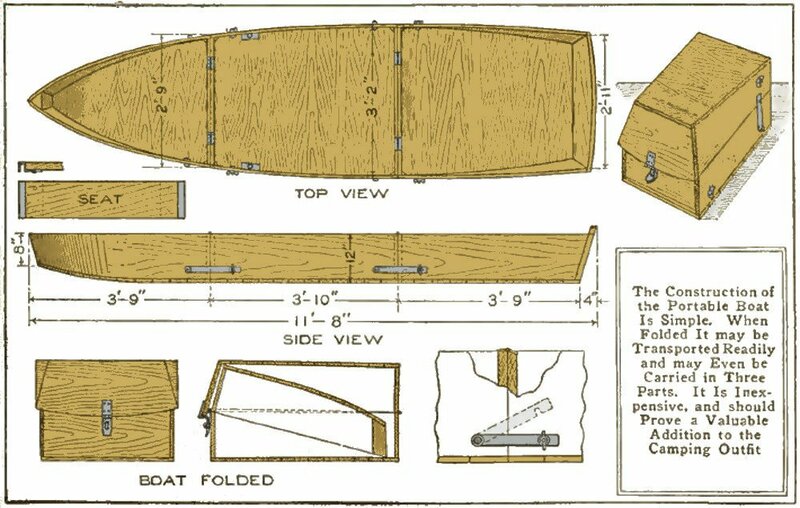 A portable folding boat that is inexpensive, easily made, and readily transported is shown in the illustration. Since the bow section folds inside of the stern portion, it is important that the dimensions be followed closely. The material used is 7/8-in. throughout. Make a full-size diagram of the plan to determine the exact sizes of the pieces. Brass screws are best for fastening this type of work, but copper plated nails may be used. Tongued and grooved stock is best for the bottom. The joints should not be driven together too firmly, to allow for expansion, and all joints in the boat should be packed with red lead or pitch. The adjoining ends of the sections should be made at the same time, to insure a satisfactory fit when joined. Braces are fixed into the corners. Metal straps hold the sections together at the bottom of the hinged joints. These should be fitted so that there is little possibility of their becoming loosened accidentally. The front end of each strip is pivoted in a hole, and the other end is slotted vertically on the lower edge. Their bolts are set firmly into the side of the boat, being held with nuts on both sides of the wood. A wing nut, prevented from coming off by riveting the end of the bolt, holds the slotted end. Sockets for the oars may be cut into hardwood pieces fastened to the gunwales. The construction of the seats is shown in the small sketch at the left.